Carbon capture can significantly reduce emissions from industrial activities, similar to how other technologies have reduced acid rain and smog pollution. The first carbon capture project began over 50 years ago in the United States for enhanced oil recovery, a process that uses carbon dioxide for oil production. Today, about two dozen large carbon capture projects exist around the world.1 The technology is supported by a diverse coalition – from environmental organizations to industry heavyweights2 – to make carbon capture more affordable and scalable. Carbon capture is a critical technology that can reduce emissions from power plants, industrial facilities (e.g. cement and steel), and even straight from the atmosphere. A recent string of commercial projects, including NRG’s Petra Nova and Air Product’s Port Arthur, have validated carbon capture from novel sources. Further development will drive new concepts and technologies, such as the zero-emission NET Power demonstration plant. Historically, basic government research has reaped dividends for our economy. In the case of natural gas, taxpayers are still benefiting from government R&D into hydraulic fracturing technologies to the tune of billions of dollars each year. National laboratories research developed the basic mining bits, 3D imaging and liquids that were instrumental in the commercialization of fracking technologies. Carbon capture holds similar promise. 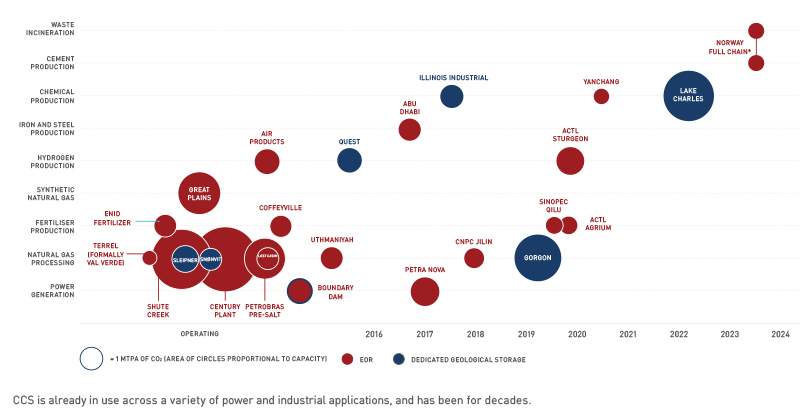 A study by ClearPath and the Carbon Utilization Research Council found that dozens of large power plants with carbon capture could be economically deployed by 2040, assuming Department of Energy cost goals were met. Many carbon capture technologies in the development pipeline have been successful at the small bench scale and have yet to scale up. Demonstrating at larger scales is difficult for the private sector to overcome because it often requires tens or even hundreds of millions of dollars. Private-public cost shares are needed to expeditiously prove first-of-a-kind technologies to facilitate commercial guarantees and increase investment community confidence. Under the current process, complying with federal regulations to store carbon dioxide underground is a lengthy and often prohibitive process. The government should explore ways to increase commercial certainty while preserving environmental quality. Carbon dioxide can be safely stored underground in certain types of geology, such as the basalt formation shown above. Ironically, some environmental regulations discourage carbon capture projects. For example, the permitting process for carbon dioxide injection takes several years to complete, with unclear approval times. This uncertainty unnecessarily drives up costs for carbon capture developers and are dampening the appetite for storing emissions. The government can also expedite carbon dioxide pipeline construction. As demonstrated by the Keystone and Dakota XL delays, constructing pipelines can take longer than anticipated. Although industry may be willing to pay for new pipelines, federal reviews can stymie development. To reduce bureaucratic delays, the pipeline corridors can be established at the state or federal level. In 2015, Wyoming launched an initiative to pre-permit certain areas with the federal government to reduce the regulatory burden on prospective developers.